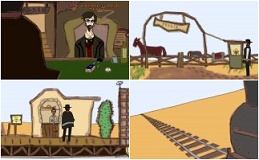 The Man from Fugue State is a traditional point-and-click adventure game by Salvador Haggini (aka Graham Nichols), set in the Wild West, charmingly illustrated with plenty of puzzles to solve and lots of humour. The game is free to download at themanfromfuguestate.weebly.com, with lots of Western style music tracks sourced from the internet including 3 of my own tracks from Soundcloud. See also reviews at gamingrespawn.com and adventuregamers.com. 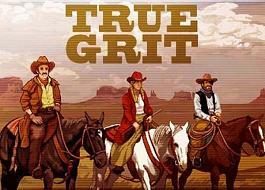 This music was composed for a Game to tie in with the remake of the movie "True Grit". The different tracks are played in different environment levels, and also used within mini-games. Digital Goldfish (now merged with Ninja Kiwi) "Reach for the Starz"
4T2 Multimedia - developers of web games for Comet "Crazy Sleigh", Aiwa "Cosmic Boom" and Polycell "Smooth Mover"
Spark Entertainment - games "Dragon Tale", "eXode", "Bubble Trouble", "Monkeynoid" etc. Binary Graffitti - "Poker Showdown", "Sweet Dreams", "Diamond Hunter", "Chaos Realms", "Mixem", "Present Panic" etc. Progressive Media - games "Bombjack", "Sheep Mania", "Progressive Pinball - The Vikings" etc. Jim Paterson contributed "additional music" to an online soap/drama series called The Bay. Its first season consists of 16 "webisodes" - 4 chapters of 4 parts each. All 16 Webisodes made so far can be watched on The Bay website. The series has had some great reviews and is expected to be converted into a season of half-hour episodes for Television on US and International channels. Jim Paterson on IMDB (with resume). There's a lively arrangement of "Circus Ride" played by the Tandarica Orkestar, a Balkan Circus Band based in Spain. This is their homepage on MySpace - select Circus Ride from the Playlist.